Wyoming bed and breakfast travel guide for romantic, historic and adventure b&b's. 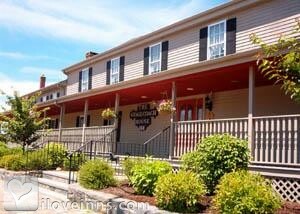 Browse through the iLoveInns.com database of Wyoming, Rhode Island bed and breakfasts and country inns to find detailed listings that include room rates, special deals and area activities. You can click on the 'check rates and availability' button to contact the innkeeper. Wyoming, Rhode Island is near attractions such as Mohegan Sun, Mystic Aquarium, Mystic Seaport, Roger Williams Park Zoo, Newport Vineyards, Kenyon's Grist Mill, Theatre by the Sea, The Ryan Center, and Washington County Fair. Wyoming visitors who want to try their luck at gaming can visit Foxwoods Casino. Yawgoo Valley Ski and Sports Park and Stepping Stone Ranch are nearby. Wyoming is near several golf courses including Richmond Country Club, Meadowbrook Golf Club, Beaver River Golf Club, Laurel Lane Country Club, and Pinecrest Golf Course. From Wyoming bed and breakfast inns, guests can dine at restaurants such as The Pavilion, Cucina Twist, and Nordic Lodge. By Stagecoach House Inn.